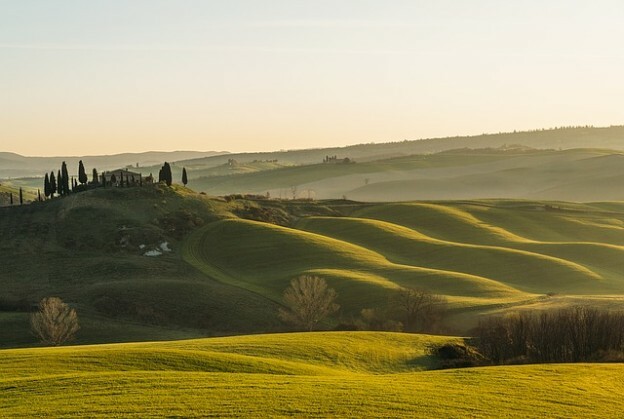 When you think about Tuscany, it’s very probable that you imagine green and golden hills, covered by vineyards, and long, winding roads closed between two lines of tall and pointy cypresses. Maybe you don’t know, but if you have imagined the scene, you have just seen the Orcia Valley, Val d’Orcia in Italian. Introduced in 2004 in the UNESCO World Heritage List, the Orcia Valley is the maximum and most beautiful expression of the Italian panoramas. A perfect union of nature and culture, its geography and ecosystem are the precious heritage that has been left to us by the people who lived these places along the centuries. Wise people for sure, who left for us to see a rich and beautiful treasure made of medieval buildings, lonely towers lost in the green, some of the best artistic works of the Reinassance period and also a bountiful wine and gastronomic culture. If you never visited the Valley, consider to stop in the jewel city of Pienza, built on a concept of good management of the city, or taste a good glass of the world famous Brunello wine, in the city of Montalcino. This entry was posted in Luxury Car Hire Location, Tuscany's Treasures, Wonderful Places and tagged luxury car rental, rent car europe, rent cars italy, rent cars tuscany, rent luxury cars italy on July 22, 2016 by admin.